We found something fascinating in our garden this weekend. Since the start of Spring we've been hearing an unusual noise in the garden as the light begins to fade. The best way to describe it is like a smoke alarm that's losing it's battery power and you get a high beep every 3 seconds. Whatever animal it was we knew that there were a few of them around. Every night we are bombarded with a call and response session as one would beep near the house and another would reply off in the woods, then another somewhere else. We spoke to a number of people about what it could be, the best answer we got was a Scops Owl, though I knew it couldn't have been as one noise seemed to be coming from the flower bed in front of the house. 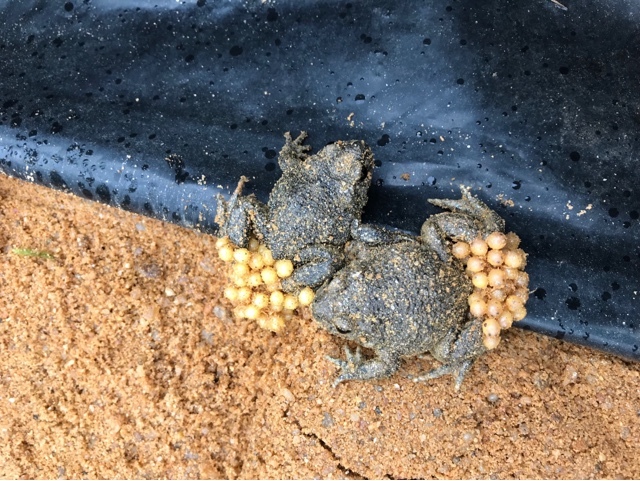 Well this weekend we discovered what it was...midwife toads! Uncovering our pile of sand we found these nestled in the dark, carefully looking after their eggs which are attached to their backs. It's the males that carry the eggs, and when they're about to hatch they'll start looking for water. We have a number of water points on our land. We have a pond in front of the house, which is where I imagine they'll head to first. But we also have a couple of wells, and water collection points by the garage and barn. So come Summer we may be inundated with toads! Are you a fan of wildlife? Have you found an unusual animal recently? Bonjour! I'm Becky and we're The Brown's. We used to live in London but now we live in South West France at Wild Oak Wood. This year we're setting up glamping here at our home and hosting inspiring workshops along the themes of mindfulness, crafting and bushcraft! We're big fans of nature (though the boys would probably put Lego first!) and love exploring around our home and further afield with trips in our campervan. Visit Rue Du Belvedere's profile on Pinterest.